Always finding ways to keep our butts in the seats at their amazing Alamo theaters, Drafthouse brings to us VINEGAR SYNDROME PRESENTS. Bringing back a Crittendon Collection of classic genre gore punk films, VS and Alamo have united to release these films back into theaters for us to enjoy all over. Fitting for the upcoming month their first feature in the VS series is the 1980 grimy Santa slasher CHRISTMAS EVIL/ YOU BETTER WATCH OUT. Read on for the full details from Alamo Drafthouse, awesome new CHRISTMAS EVIL poster and check out CHRISTMAS EVIL in theaters December 11th with more classics on the way. Alamo is excited to announce the launch of the brand new film series “Vinegar Syndrome Presents,” coming to Alamo Drafthouse locations nationwide starting this December with the surreal and insane Santa Claus slasher from 1980, CHRISTMAS EVIL / YOU BETTER WATCH OUT. Vinegar Syndrome is recognized as perhaps the most important home video label in the world for genre film – the Criterion Collection of exploitation/horror/weirdo movies. Founded by genre-film lovers for genre-film lovers, the label’s mission is to preserve, restore, and release the rarest and most unique exploitation and horror movies from their massive archive. VS works tirelessly to rescue these titles from the brink of oblivion with brilliant new digital restorations from original negatives, spending countless hours preserving them in their state of the art restoration lab. Each month, “Vinegar Syndrome Presents” will showcase one of these brand new 2K digital restorations on Alamo screens across the country. And in true exploitation fashion, there will be drink and menu specials that complement the raw, dirt-cheap nature of the movies themselves. The new series arrives just in time for the holidays with the perversely fun CHRISTMAS EVIL / YOU BETTER WATCH OUT. 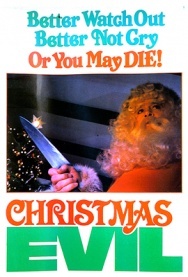 Slasher Santas may have ruled the 1980s, with a wide variety of ho-ho-homicides perpetrated by tubby bearded men in such films as SILENT NIGHT, DEADLY NIGHT and DON’T OPEN TIL CHRISTMAS. But CHRISTMAS EVIL / YOU BETTER WATCH OUT is the only holiday horror-ride that not only features one of cinema’s all-time finest performances – Brandon Maggart (of SESAME STREET!) as a misguided St. Nick in a full scale spiral of Santastic savagery – but also the greatest closing shot of any movie ever. Future “Vinegar Syndrome Presents” titles include: RAW FORCE, DEMONOID: MESSENGER OF DEATH, THE TELEPHONE BOOK, SOME CALL IT LOVING, MASSAGE PARLOR MURDERS and many, many more.